Don’t forget everyone, ID10T Festival will be this weekend June 24th and 25th, at the Shoreline Amphitheatre in Mountain View, California. But this wont be your normal comic convention, it will have big musical acts such as OK GO and WEEZER along side tons of comedy acts like Garfunkel and Oates, Demetri Martin and more! Not to mention hosted and created by the one and only Chris Hardwick! You’ll even be able to catch the Retrenders crew there too! September Mourning, Vol. 1 collects the Kickstarter first comic for the regular market on the heels of the band’s upcoming tour across the U.S. The group will be setting up intimate acoustic shows and signings at comic shops while they’re on tour. Click here to catch September Mourning live this summer! September Mourning has no past that she can remember, only a strange and shadowy present filled with the voices of the dead. 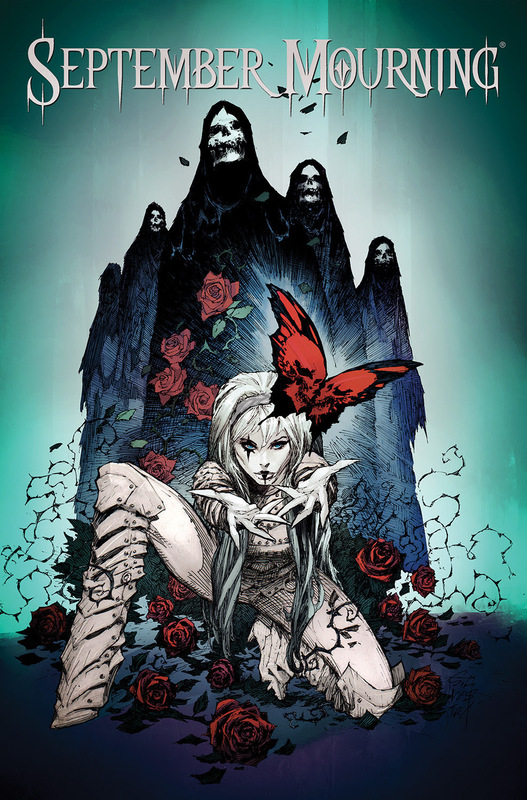 Turned into a unique hybrid by the former Reaper of the lonely, injured, and abused, September Mourning is the only human/reaper to exist. Tasked with reaping the souls of the “worthless” by her mysterious tattoo, September hides and protects them until she can help them realize the last thing they had left undone in life. Whether it’s aiding souls to expose abusers, find lost loves, or settle old debts, in each case September is guided by voice of the Skullfly, which only she can hear. Call me an old fart, but I love my compact discs and vinyl records! I miss going to the various Tower Records in SF and exploring the import section at the Virgin Megastore on Market Street. Specialty retailer Mondo known for their movie tribute posters and vinyl OSTs will sell vinyl LP soundtracks from the popular Marvel Netflix shows Daredevil, Jessica Jones and Luke Cage. The Mondo releases feature awesome artwork and packaging. “Got to catch them all!” You probably heard this song in your lifetime. The voice behind the song is actor/singer Jason Paige. Ramen host Eddie Ballar interviews the Pokemon Theme song singer Jason about the song, his other commercial jingles and upcoming projects from Stan Lee’s Los Angeles Comic Con. Reebok signs up new K-pop girl group BlackPink to rep the Reebok Classic brand. The YG Entertainment pop group features Kim Ji-soo, Jennie Kim, Roseanne Park and Pranpriya Manoban. BlackPink has released two tracks: Whistle and Boombayah. Have you watched Stranger Things yet? Well, get a Netflix subscription! A few weeks ago, our Retrenders colleague Johnny Moreno binge watched Stranger Things and wrote a review on it (Stranger Things review). He then called me in the middle of the night to tell me to watch it! So I did and it was well worth it. Like many 80s kids, I had fond memories of movies and music from that era. And one of the many important factors in the success of Stranger Things is the music made by Kyle Dixon and Michael Stein. They have just released 2 new tracks to preview for the upcoming Vol 1 and Vol 2 releases digitally and CD format. What I’m bumping on my steps walking? The latest by Oakland native Kehlani with the song CRZY. It’s a smoking in-your face bass bumping track. She has drop two mixtapes: Cloud 19 and You Should Be Here. One part of Japanese culture that’s always been interesting is the art of edible baked food. Pop star Carly Rae Jepsen was in Japan promoting her last album EMOTION and while there, she also explored Japan’s bakeries. Coming to a big weekend music festival near you! The world’s biggest bouncy castle will appear at UK music festivals this year. Creator Matt the Hat will debut the bouncy castle at the Common People music festival this weekend in Southampton City Centre. The bouncy castle fits 100 party-goers. It measures 78ft long, 68ft wide, 42ft high and takes 5,000 cubic ft of air to inflate. Interview with Jrock band Back-On! This video was recorded at FanimeCon 2015, our Ramen and a Half host Eddie Ballar interviews the Jrock band Back-On! The band talks about how they got together and their favorite anime to watch. James Brown, Isaac Hayes, UTFO, Hall & Oates, Lisa Lisa and the Cult Jam, Samantha Fox, Kurtis Blow, Big Daddy Kane, Backstreet Boys, N*Sync, Britney Spears, Selena, The Black Eyed Peas, Rihanna – just to name a few. What do all these musicians have in common? Full Force! Before producer/writing teams like Stock Aitken & Waterman (SAW), The Neptunes (Pharrell Williams & Chad Hugo) and Cheiron Studios (Max Martin & Denniz PoP. More than just producers/writers/remixers – Full Force is a band too. I grew up in the 80’s listening to many Full Force produced jams. Check their interview out on Sway’s Universe. What’s on my iPod? Playing Niykee Heaton’s latest album “The Bedroom Tour Playlist.” Niykee appears on Sway’s Universe to talk about rise from a Instagram/YouTube artist from her bedroom and why she covered rap songs. She also discusses her South African roots, family background, the pitfalls & traps of the music industry and growing up in “white” suburban Chicago. Music: The PSB are back with Pop Kids! One of the top rap duos I listened to growing up in the 1980s was Kid ‘n Play. I remember watching House Party on VHS and jamming to “Ain’t Gonna Hurt Nobody.” Sway in the Morning does in-depth interview with the rap duo on the past, present and future of Kid ‘n Play. I don’t know why some YouTube videos have so less hits and views. There should be tons of views for this as OTHERtone show hosts Scott Vener and Pharrell Williams on Beats 1 channel interviews lead singer of Alabama Shakes Brittany Howard. When I heard first this track I thought I was listening to funky Jpop rap group HaliCali from years back, but I was wrong. This cute catchy Jpop track is by veteran Jpop singer Ando Yuko who teams up with DJ Miso Soup and MC Rice. Every once in-awhile, you watch a music video and say to yourself, “Wow, that is really cool.” This “Southern Winds (Revisited)” music video taken from artist Jane Lui’s album Goodnight Company took a year to make. It her a long time to build the cardboard world of sets and places. It’s not Viral Video Friday yet, but it is Hump Day Wednesday here in my workstation. Here’s a soothing and relaxing animated music video. Put your headphones on and sit back. It’s only 3 minutes. This past weekend, Comikaze Expo unveiled “No Hero Now,” an action packed cinematic music video which tells the story of Rian, a reformed and retired assassin who is pulled back into action after getting a distress call from her old team. After discovering a socialite referred to as “The Mantis” is investing millions into engineering genetic serums for humans, Rian must square off with a newly powered super human to avenge her fallen comrades and rescue her team’s leader. Making waves for the last couple of years from Japan and touring around the globe is Jpop trio glam-metal band Babymetal. Now the band gets Funko Pop! bobble-heads coming this December 2015. The Pop! Rocks series features: Su-metal, Yuimetal, and Moametal. Experimental musical jam session. At this live event, these two girls jam away with a circular spinning xylophone contraption and play with a super drum set. In the age of digital downloads and streaming music, who goes to the record stores and buys the physical copy? Well, if you’re an old-school fanboy like me, this is one CD you should definitely buy, The Transformers: The Movie Original Motion Picture Score by Vince DiCola. Let’s not mistake these soundtrack CDs for the Michael Bay live-action crap, this is the 1986 animated Transformers flick. Yes, you should be aware The Transformers: The Movie CD which came out in 1986, but that CD featured all the pop songs like “The Touch” & “Dare” and only a couple of score tracks. This release features 25 tracks of music score from the movie.